With spring here and Earth Day around the corner, this is a fun activity for kids. It gets them exploring outdoors and doing some painting too! 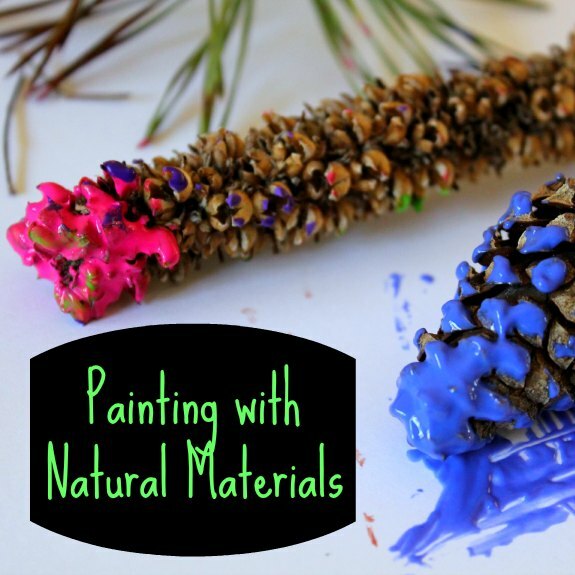 Natural materials to paint with, such as: twigs, leaves, pine needles, flowers, pine cones, plants, etc. – especially items with interesting shapes and textures. * Be sure that kids collect these materials while showing respect for nature. For example, make sure they know not to rip branches off trees or cause damage to plants – you might want to have them use only dead or dry materials. If you are at a nature center or natural area, there are likely rules about staying on trails and not collecting or removing any natural materials. 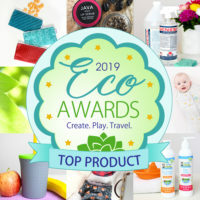 Have your kids explore outdoors for items they might want to paint with (again, respecting their natural surroundings). Depending on their age, you can direct them towards ideas or have them think about things like texture. Gather your items and decide which items (or all!) you want to paint with. If your kids have gathered up large branches or messy items, you may want to do a quick check as far as what is actually usable or needs to be altered to make it usable. Place paint on a plate or palette so that it is easy enough to dip the materials in. I love this natural painting idea. Way for everyone to see how different twigs leaves etc leave their mark. What a great way to explore art and nature together! My kids loved projects like this when they were small. 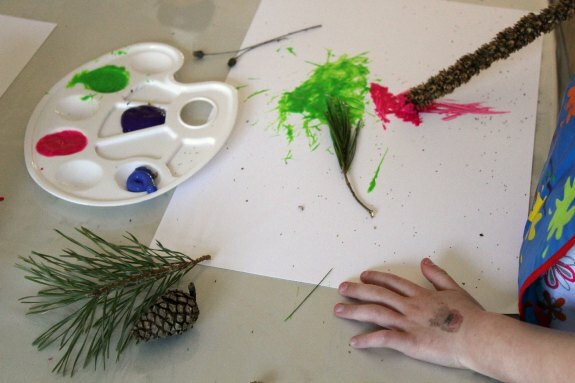 My kids loves doing painting a lot and I think this is a right idea for them to do painting while exploring the nature. I love these ideas! What a great way to incorporate nature into play too. My kids are craft crazy, me not so much, but I could get on board with this! 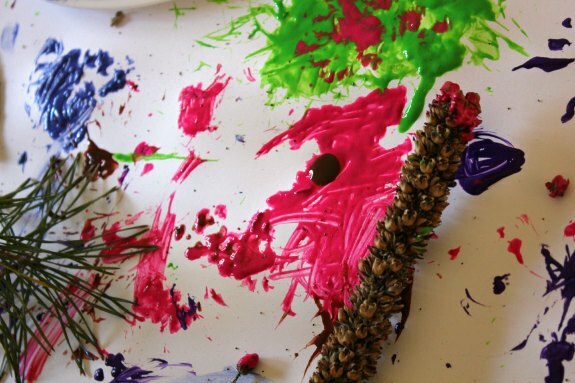 This is a fun way for kids to create art! I had not thought of something like this before. I bet my kiddo would really enjoy doing this project.